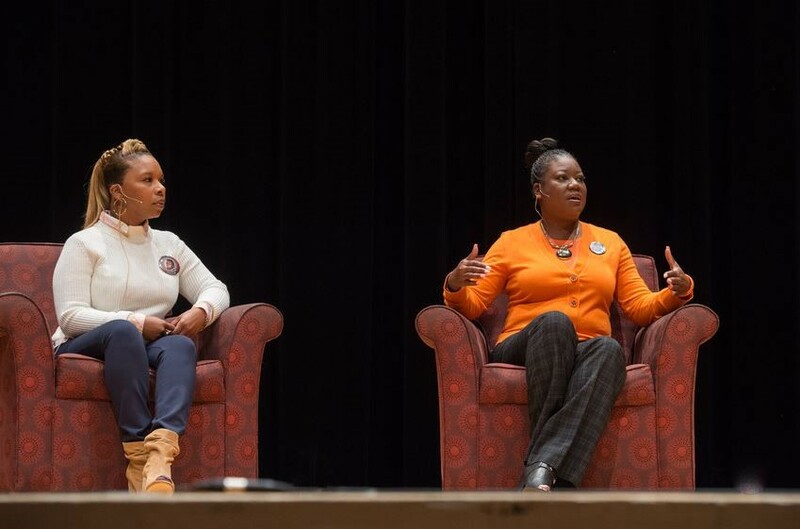 Lesley McSpadden (left) and Sybrina Fulton speak during the “(In)Justice for All” event at Goldstein Auditorium. Nearly 1,000 students, faculty, staff and community members gathered last Wednesday at Goldstein Auditorium to hear from the mothers of Trayvon Martin and Michael Brown as part of a forum titled “(In)Justice for All.” The panel discussion with Martin’s mother, Sybrina Fulton, and Lesley McSpadden, Brown’s mother, also featured CNN anchors Sunny Hostin and Fredricka Whitfield, National Bar Association President Benjamin Crump and Syracuse University Department of Public Safety Chief Bobby Maldonado. During the nearly two-hour discussion, moderator Nina Rodgers ’16 deftly asked questions of the panelists, including questions submitted via social media. Fulton and McSpadden painted vivid images of the sons they lost. Both teens were shot to death: Trayvon Martin by neighborhood watch volunteer George Zimmerman, and Michael Brown by police officer Darren Wilson. Zimmerman was acquitted of second-degree murder charges, while a grand jury did not charge Wilson with a crime. 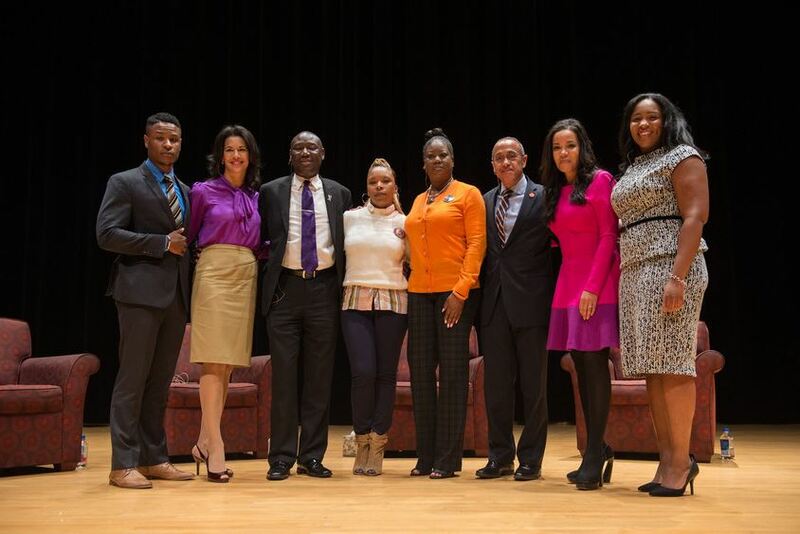 From left are Travis Davis ’16, Fredricka Whitfield, Benjamin Crump, Lesley McSpadden, Sybrina Fulton, Bobby Maldonado, Sunny Hostin, and Nina Rodgers ’16. The discussion also explored policing tactics and the Black Lives Matter movement. CNN anchors Hostin and Whitfield talked about media coverage of both cases, while Crump credited young people, like many of those in attendance, with giving the story life and legs. “The young people and social media moved the major media, when all of you got on social media saying that ‘I am Trayvon’ … it helped people pay attention and say Trayvon’s life matters,” said Crump. Chief Maldonado called it an honor to be part of the panel, and added context to the discussion from a police perspective, but also, as he pointed out, a parent.